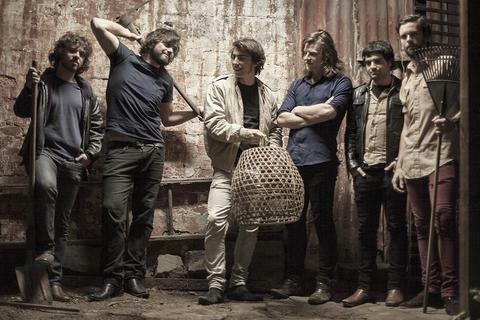 Emerging in 2011 to play an extended residency at infamous rock club Cherry Bar in AC/DC Lane, Melbourne, Money For Rope were a sprawling 6-piece rock band that got everyone in the rock’n’roll town talking. For the devil-may-care blues rock band - backed by two drummers, and a sound fathered by The Saints, The Sunnyboys, and Radio Birdman, with a slight tinge of The Doors - it was the start of rapturous applause, serious hard work and more than a handful of shows conducted in casts and wheelchairs. Immediately signed by Wally Kempton of The Meanies, the band steadily released a series of 7” singles - ‘Slow Dance’, 'My House Or Yours', 'I've Had Days', and 'Disable Ksana' – while proving themselves in the often harsh climate of Australian rock’n’roll. Squaring away crucial appearances at ‘boutique’ and beloved Australian festivals like Golden Plains, Boogie!, Cherry Rock, The Gum Ball, The Hills Are Alive and NYE On The Hill, Money For Rope were added to lineups for major festival events The Big Day Out, Splendour In The Grass and Queenscliff Music Festival, while support slots began gathering for celebrated, often legendary, artists including Dan Sultan, Rose Tattoo, Cosmic Psychos, Hanni El Khatib, White Denim, Bob Log III, Courtney Barnett, Those Darlins and The Living End, earning them a Best New Artist nomination in Melbourne’s prestigious The Age’s EG Awards. November 2012 saw the long awaited release of their eponymous debut LP [Thornbury Records], the sole musical soundtrack for that summer’s nationally televised Iron Man Series, just after their appearances at Australia’s preeminent music industry conference, BigSound. The band’s performance in downtown Brisbane, resulted in a Spanish tour, mostly as guests to The Bellrays side project Lisa & The Lips. A singles compilation album called Been In The Wars was exclusively released on 12" in Spain on the Grabaciones de Impacto label, while spin off gigs - including shows in London, Berlin, Copenhagen and showcase events Lleida Live Sessions [Spain], Monkey Week [Spain] and Nouvelle Prague [in the Czech Republic] - put the hard-working, groove-driven rock band squarely in front of European summer festival promoters who promptly booked Money For Rope into over a dozen festival dates. Returning to BigSound in 2013, Money For Rope were this time seen by a SXSW staffer who swiftly extended an invitation to showcase at the hallowed Austin conference in 2014, an appearance expected to be strengthened by the number of US college radio stations steadily supporting Money For Rope’s record. With a split EP [also featuring The Bowers] slated for March, and in preparation for their US tour in March, UK tour in May and a run of European festival dates that span from June to August, Money For Rope have stripped back to a core 4-piece membership [with second touring drummer] leaving Jules McKenzie [vocals, guitar, occasional saxophone], Michael Cini [bass, vocals], Rick Parnaby [keys, guitar and vocals] and Chris Valdemarin [drums] to present the leaner, hungrier band to worldwide audiences.